How can Christians defend themselves from being deceived by New Age teachings? Dr. Reagan: One of the new teachings that really disturbs me about this whole New Age impact on the Church is that more and more I am seeing Christian leaders either directly saying or implying that there are many different roads that lead to God. There are many different roads, they believe, like there is the Muslim road, and the Hindu road, but they all lead to the same God, they say. 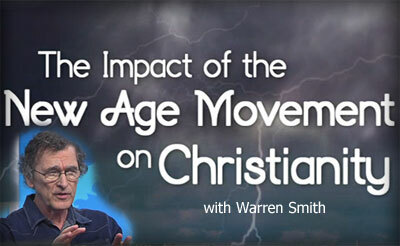 Warren Smith: It is exactly what New Age leader Neale Donald Walsch said. He said that speaking for his god, he said, "There are a thousand ways to God and they will all get you there, except for one, and that's the one that denies that there are a thousand ways to God." Dr. Reagan: There seems to be a tremendous feeling today in many churches that we cannot really preach the Gospel because the Gospel calls for repentance. The Bible talks about sin. It talks about the blood of Jesus. Those teachings will be offensive. We claim we've got to be seeker sensitive, and we've got to be sure that we don't offend anyone. Well, the Gospel is offensive! Warren Smith: Jesus said, "Blessed are those who are not offended in me." But, Jesus taught that His teachings would be hard for people to follow. You and me are going to be persecuted for believing and teaching about them. Jesus said that, "They hated me; so they are going to hate you." But, Jesus didn't leave it at that, for as you know, we have His Holy Spirit. We are to walk in the world, but we are to stand on God's truth as the Bible teaches. We are to contend for the faith. But, what is happening today is that a lot of pastors are capitulating, for they are trying to fill their churches, but they are really compromising. Today there is also a lot of double speak. Paul warned about those who are double-tongued. James warned of people who are double-minded. David talked in Psalm 12 about those with a double heart. What is happening is that some pastors will be cornered about what they are saying and that they lead their congregations into New Age teachings. They will say, "Oh, you have to watch out about the New Age." But, then they'll come back to someone like me and accuse, "Hey, he's warning about the New Age." You've got to be really careful. One well known Christian figure who is going around at the highest levels of church assemblies and denominations said very clearly in one of his books, that to survive in the Post-Modern Church, you will need to speak out of both sides of your mouth. He actually said that! Then he used the two words imminence and transcendence, thinking he was being cute. But, that's what Alice Bailey, Benjamin Creme with Maitreya, The Aquarian Conspiracy, and other New Agers said, that God is not only transcendent out there, but that he is imminent inside each and every person. So here you've got this man who is going around to every denominational leadership level saying that to survive in the Post-Modern Era you have to learn to speak out of both sides of your mouth. He also then quotes Teilhard de Chardin who says that he sees with these emergent leaders that they are seeing faith in a much more magnificent way than their forefathers ever did. This is arrogance! Its pride! It's the crew of the Titanic telling everybody that everything's okay. Dr. Reagan: What can we do to protect ourselves against deception, because it says in the Bible that the end times are going to be a time of great deception? There are a lot of people out who think they could never be deceived. But, we can all be deceived, so how can we protect ourselves from deception? Warren Smith: Just like my old A Course in Miracles teacher once said, "Put on the full armor of God and stand fast against the wiles of the Devil." Warren Smith: No, instead, get into the Bible and stay in the Word. Nathan Jones: Romans 1:16 is our guide. Warren Smith: My old New Age teacher pulled that out of her Bible background, but she was right. This sad woman had a very difficult demise because that was one of the rare times when she quoted Scripture. The Bible is our only source of truth. It has warned about every deception that we are getting involved in today. The Bible is so completely, authoritatively from God. You need to measure, like the Bereans, whatever you are being told using the Bible. You've got to remember a little leaven, leavens the whole lump. Harry Ironside, the old Moody Bible teacher, once said, "The most insidious form of deception is error mixed with truth." So, people need to be aware that deception is coming at you from all over the place. If the Israelis can be so easily duped by Obama, its no wonder they will enter into a deal with the antichrist. It makes me wonder is Israelis are naive or stupid. So many being duped by a false gospel. R U? By GRACE alone, through FAITH alone, through Christ alone, not of any works and kept saved by God the same way for ETERNITY.